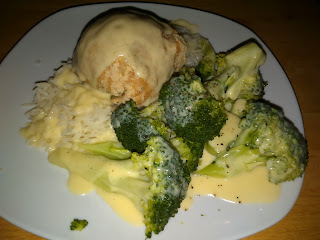 Chicken cordon suisse from Mitchell's. They make them fresh and they are excellent. Your local butcher probably makes something similar. Just pop them in a 400F oven for about 25-30 minutes. They're done when the cheese center squirts out a bit of moisture. With that I have rice and broccoli. The rice was done in the microwave with just salt and olive oil. The broccoli was steamed, cooled under running water and reheated in olive oil. Slowly whisk the butter, a teaspoon at a time for beginners, into the yolk till it's all emulsified. Whisk in the other ingredients and cook till it bubbles then turn heat to low or off. When everything is plated pour sauce over all.